Totem Pole Stolen 84 Years Ago By Actor John Barrymore Goes Home : The Two-Way The pole went from the garden decor of two golden-age Hollywood actors to the basement of a Hawaii museum. On Thursday, it was returned to Alaska tribal members. 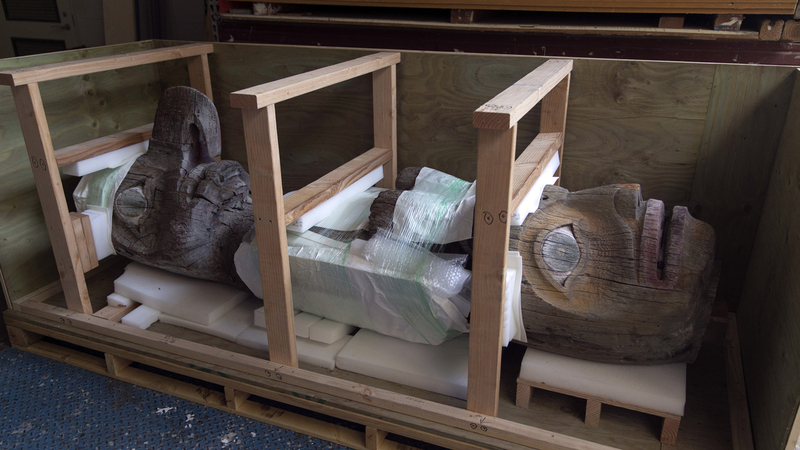 The totem pole carved by the Alaskan Tlingit tribe is boxed up at the Honolulu Museum of Art on Thursday in Honolulu. A totem pole stolen by actor John Barrymore in 1931 that later ended up as a yard decoration for actor Vincent Price was returned to Alaska tribal members on Thursday. The Associated Press reports that the stolen pole was one of more than 100 that once stood in the old village of Tuxecan on Prince of Wales Island, Alaska, which was inhabited by the Tlingit people. Barrymore — grandfather of actress Drew Barrymore — took the approximately 40-foot-tall totem pole from an unoccupied village during a yacht trip along the Alaska coast in 1931. The totem pole has carved images of a killer whale, a raven, an eagle and a wolf, and the crew sawed it in three pieces. Barrymore later displayed it in his garden. When the actor died, horror flick star Price and his wife bought the totem pole, which they then stuck in their yard as decoration, too. In 1981, the Prices donated it to the Honolulu Museum of Art. Officials at the museum didn't know the totem pole was stolen, and after the top section was briefly displayed, the pole was moved to the museum's climate-controlled basement. 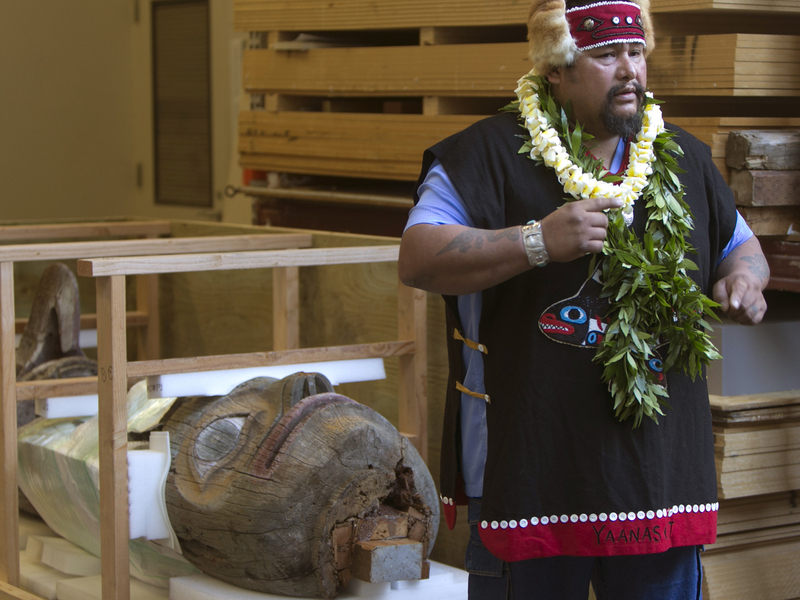 While standing in front of his tribe's totem pole, Jonathan Rowan speaks about its significance at the Honolulu Museum of Art on Thursday. The totem pole was carved by the ancestors of the Tlingit tribe. Rowan is a tribe member from Klawock, Alaska. "It was totally out of place," he recalled. "Here's this recognizable Hollywood figure in a backyard estate with a totem pole ... that was surrounded by cactus." After researching he found that the totem pole was used for burials, and before Barrymore put it in his garden, he had removed the remains of a man that were inside it. In 2013, Langdon went to Honolulu to examine it, with permission from tribal leaders. This set in motion a repatriation process funded by the Native American Graves Protection and Repatriation Act, and on Thursday the piece was returned to tribal members. "It gives my heart great peace that my ancestors can go home," she said. "I feel my father's people here. I feel my grandfather's people here, giving us strength right now."